Thisstory was updated at 3:43 p.m. ET. Twoastronauts took an extra-long spacewalk outside the International Space StationSaturday to repair a crucial cooling system, but ran out of time before theycould replace a broken ammonia pump ? their primary goal. 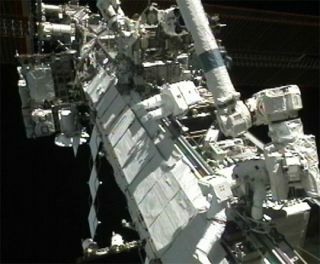 The delays stretched thework out into the longest space station spacewalk in history, NASA says. Theexcursion lasted 8 hours and 3 minutes ? making it the longest spacewalk at thespace station without a NASA shuttle present and the sixth longest spacewalk inhistory. The record for the longest spacewalker ever is 8 hours, 56 minutes wasset by shuttle astronauts in 2001. Saturday'sspacewalk was the first of two needed to complete the complicated repair. The nextspacewalk is set for Wednesday. Theproblems for Wheelock and Caldwell Dyson cropped about four hours into thespacewalk, when one of four ammonia hoses they needed to disconnect stuck fast. "Wow,that is not budging," Wheelock said as they spacewalkers fell behindschedule. The delays ultimately prevented the astronauts from disconnecting thestricken pump and installing its replacement. A second spacewalk is planned forWednesday to continue the work. Theastronauts began their spacewalk outside the InternationalSpace Station at 7:19 a.m. EDT (1119 GMT) as the outpost flew 220 miles(354 km) above Earth. Theastronauts managed to disconnect the other hoses, some of which released frozenbits of ammonia coolant, which the astronauts said resembled tiny snowflakes.Any ammonia that attached to their spacesuits was expected to bake off in thesunlight. Asidefrom the ammonia leaks, those hoses were disconnected swiftly. "Don'tyou wish they were all that easy?" Mission Control radioed thespacewalkers. Finally,the Wheelock returned to the stuck hose. He banged on it with a lever tool andmanaged to free it, only to see a large amount of ammonia leak out. "Youcan see, it's got a pretty good snowstorm there," Wheelock said. "Boythat's a lot of pressure in there." Theastronauts waited while Mission Control decided what to do and described theammonia flakes leaking out. "Thatone looked like a giraffe," Wheelock said. Ultimately,the astronauts left the hose connected to the faulty pump as time ran out. Atone point, the carbon dioxide sensor inside Wheelock's spacesuit failed. As aprecaution, Mission Control told him to make sure to report any symptomsrelated to elevated carbon dioxide levels ? though none were reported. The ammoniapump failed July 31, knocking out half of the spacestation's cooling system and forcing astronauts to turn off someexperiments and systems, as well as leave others without backups, in order toprevent the station from overheating. A tripped circuit breaker, likely causedby a power spike, caused the malfunction, station managers have said. Wheelock andCaldwell Dyson were initially slated to perform a different spacewalk onThursday. That spacewalk was aimed at preparing the space station for futureconstruction work. Those tasks have been postponed. Saturday'sspacewalk marked the first for Caldwell Dyson and the fourth for Wheelock. Click here for space station missionupdates and SPACE.com'sNASA TV feed.